A wakeboard tower bimini top, as its name suggests, is made to be mounted on your boat's wakeboard tower. Check out Great Lakes Skipper's dozens of discount wakeboard bimini tops! We have wakeboard tower bimini tops in a dazzling array of colors from manufacturers like Tracker, Baja, Dowco, MasterCraft, Stratos, Larson Boats, Bayliner, Sea Ray, Gekko, and Cobalt. Get your measurements together and give us a call - we're here to help. To determine which boat bimini top is best for your application, simply choose the length/depth (front to back), height, and width that best accommodates your boat and your requirements. 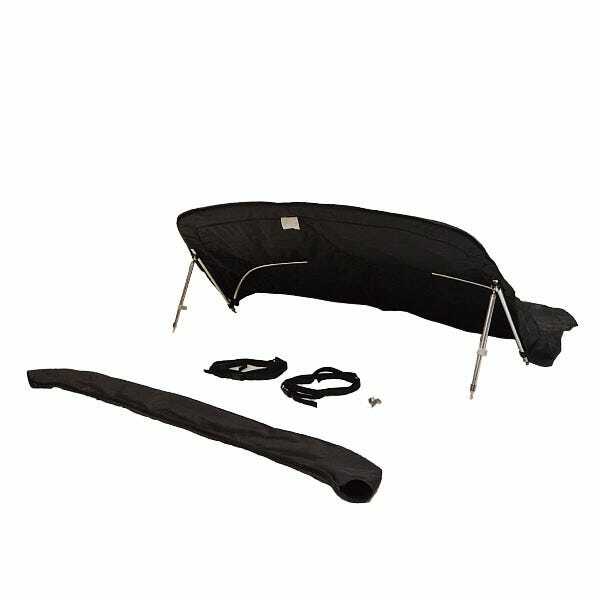 The height as well as length/depth determines how much shade your bimini top will provide. Also consider the coverage area when the top is deployed or opened and where it falls when it's closed and folded down at the rear of the boat. Remember to ensure that there is enough space in front of and behind the deployed top to mount eye straps to secure the hold-down straps. Chaparral Boat Bimini Top SN1-3D00AA-A88 | SSI Sunesta Blue 88" To 93"